Neuer, Susanne, Morten Iversen, and Gerhard Fischer. 2014. The Ocean’s Biological Carbon Pump as Part of the Global Carbon Cycle . Limnol. Oceanogr. e-Lectures, doi:10.4319/lol.2014.sneuer.miversen.gfischer. The Biological Carbon Pump includes all those processes in the ocean that cause organic carbon formed photosynthetically by phytoplankton (primary production) in the sunlit surface layer (the euphotic zone) to be removed from contact with the atmosphere. It is a mechanism that sequesters carbon dioxide (CO2) for weeks to hundreds or even millions of years (geological time-scales). 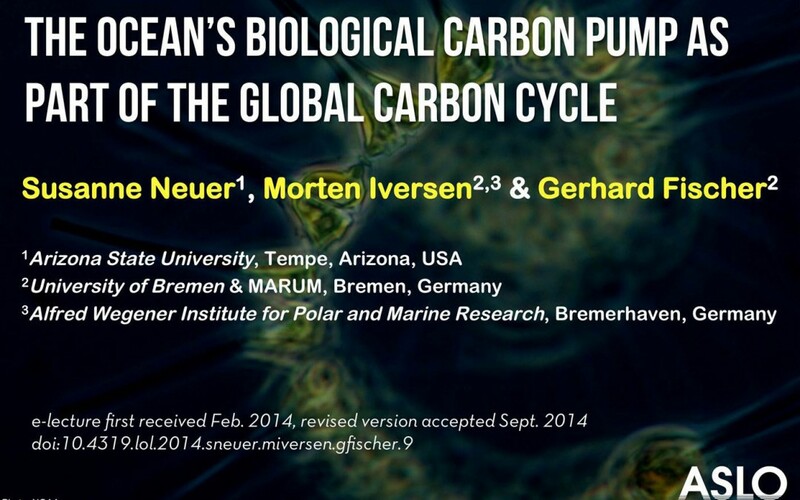 Together with the physical carbon pump, the biological carbon pump constitutes the ocean’s CO2 sink, and these two major processes in the global carbon cycle have removed about 2- 2.5 Pg Carbon per year (last decade average)(I Pg=1015g). Today, about half of the CO2 emitted from fossil fuel burning and land use changes remains in the atmosphere, and the other half is captured by land sinks and the ocean. The modern carbon cycle is often completely separated from the short- and long-term carbon cycles of the geological past, and students from biology or biogeochemistry rarely learn about these processes and the respective timescales in a joint lecture. The purpose of this interdisciplinary lecture thus is to cover processes related to the biological carbon pump and how it functions, while paying close attention to the relevant timescales in the global carbon cycle. Note that we focus mainly on the production and sinking of particulates, we do not delve into detailed mechanisms of carbon sequestration due to the removal of dissolved organic matter. Topics will include an introduction to the different carbon pumps (biological, carbonate and physical), followed by a detailed process-oriented introduction to the biological carbon pumps. This will also include the organismal aspects, such as an introduction to phytoplankton, primary production, distribution of primary producers in the global ocean, and the role of zooplankton in the biological carbon pump. More mechanistic aspects follow, such as the concepts of new and export production, the flux attenuation and the role of mineral ballasting. We cover specific aspects of the lecture as modules (“Excursions”) that give the reader/lecturer the chance to explore some topics in greater detail. 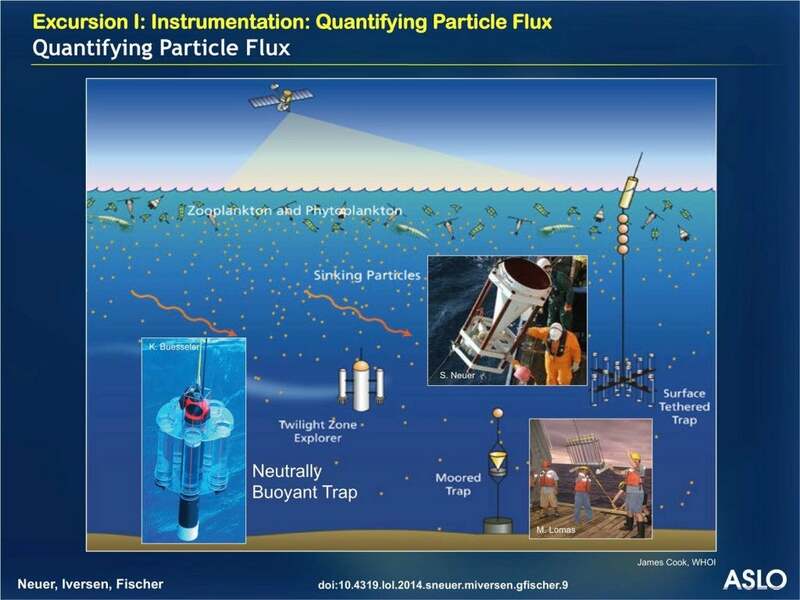 These “Excursions” are entitled “Instrumentation: Quantifying Particle Flux”, “Particle Sinking and Degradation” and “The Biological Carbon Pump on Geological Timescales”. The lecture is intended for senior undergraduates/graduates students and can be used in courses such as Oceanography, Biogeochemistry, Geology, and Environmental Life Sciences.